MPA Creative were delighted to witness Bartosz Zmarzlik clinch victory at last month’s Adrian Flux British FIM Speedway Grand Prix in Cardiff. Zmarzlik topped the podium ahead of home hero Tai Woffinden and fellow Polish international Maciej Janowski after dropping just two points on his way to an impressive haul of 19. The Gorzow and Vetlanda rider’s electrifying starts and sensational speed made him the man to beat in the Welsh capital, but he admits it has been far from an easy start to SGP 2018. Despite finishing third at the previous round in Hallstavik, Zmarzlik was not content with 23 points in the opening three rounds, so he’s delighted to have reached the halfway point in the series with a Cardiff victory, and he paid tribute to his team for helping him hit top speed as he became the second straight Polish winner at the Principality Stadium. Zmarzlik, who follows in the tyre-treads of 2017 winner Janowski, said: “I feel so very good because I won my first GP in Cardiff and this is the third time I have won a GP. “I’m very happy because my team has worked so very hard all year. They have worked for me and today we got a good result, and that’s for the team – not just for me. The whole team wanted it so badly. Despite hitting his SGP stride, Zmarzlik isn’t entertaining talk of a medal push. He’s fifth in the standings on 55 points – just four behind Janowski in third and six short of Fredrik Lindgren in second going into the Scandinavian SGP in Malilla on August 11. He said: “I am only focused on scoring good points and we’ll see what happens after the last round. Zmarzlik may not compete regularly in the UK, but he loved his weekend in Cardiff and the support he received from the fans – especially those in Polish red and white, who were well represented in the stands. He said: “I love racing speedway when there are lots of people – it’s fun to race, but you have to focus when everyone is watching. Double world champion Woffinden insists it was job done in Cardiff after he raced to second place and 16 points to extend his World Championship lead from 11 points to 20. He said: “Obviously it would have been nice to win here for the fans, so I apologise to all the fans for not being able to do that this year. But it will happen one day. “Do you know what? It doesn’t matter about winning the GP; it’s just another platform to progress towards being world champion. As ever, Woffinden got a raucous reception at the Principality Stadium and hailed his supporters for getting behind him. Third-placed Janowski admits he didn’t have it all his own way. While he won three of his five heat rides, the Wroclaw and Dackarna man suffered a last place and an exclusion. He said: “It was a very hard night for me. Finally I got to the semi-final and then I really worked hard to get to the final. I almost crashed after the start in the final. 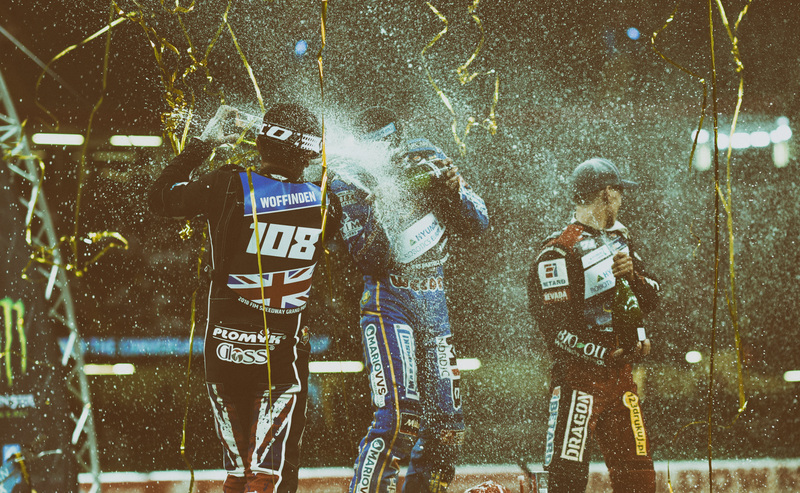 With the champagne corks popped on Cardiff 2018, fans can find out the date for the 2019 Adrian Flux British SGP on Sunday. All supporters who attended this year’s event will be given a week from Monday to book the exact same seats they purchased for Saturday in a special week-long pre-sale. Follow SpeedwayGP.com and @SpeedwayGP social media for more details in the coming days. ADRIAN FLUX BRITISH SGP SCORES: 1 Bartosz Zmarzlik 19, 2 Tai Woffinden 16, 3 Maciej Janowski 12, 4 Greg Hancock 12, 5 Patryk Dudek 10, 6 Przemyslaw Pawlicki 10, 7 Craig Cook 9, 8 Emil Sayfutdinov 8, 9 Chris Holder 7, 10 Fredrik Lindgren 7, 11 Matej Zagar 6, 12 Artem Laguta 6, 13 Nicki Pedersen 6, 14 Jason Doyle 5, 15 Martin Vaculik 3, 16 Robert Lambert 1, 17 Dan Bewley 0, 18 Jason Garrity DNR.